I didn't know what to do with myself as soon as walked in Nordstrom and saw the display for the pre-sale of the Colour Forms collection. 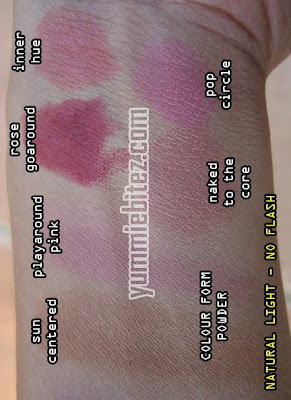 Although I won't get my goodies yet in about three weeks, at least I went home with some swatches on my arm. So what am I going to end up with? The basic and advanced brush sets, Warm Eyes palette, Sun Centered Colour Form powder, and Rose Bullion Rich Metal highlighter. I was surprised that the brush set are pretty good. It's almost as good as the full-sized one. They're all really soft unlike the Antiquitease collection which were a tad scratchy. This is a great beginner set for those who are just starting out and want to try out MAC brushes. 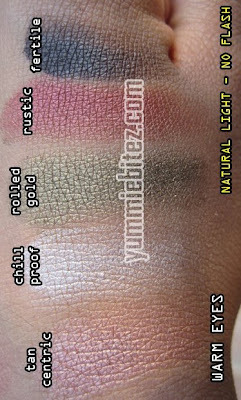 I also chose the Warm Eyes palette since it is the most pigmented palette out of the two. The Cool Eyes palette for some reason was too sheer. 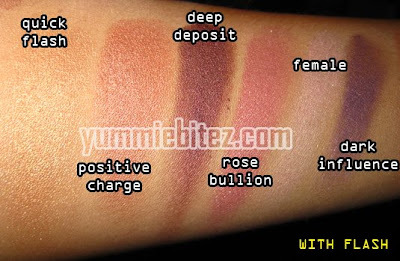 I had to dig through the eyeshadow to get a pretty decent swatch. Sun Centered Colour Form powder will be a great bronzer because of it's peachy-gold color. It has a nice sheen finish so it's not overwhelmingly glittery on your face but just enough to give you a glowly look! Rich Metal highlighter in Rose Bullion is very pretty as well. It's great as an eyeshadow or highlighter. I think I'm going to have to go back and get Quick Flash. Rich Metal reminded me of the previous Metal-X collection except that it's more creamy and consistent and almost similar to a cream color base. The guy who helped me out with my pre-sale order rock. He was soo friendly, funny, and so chatty. I wish all the MUA are like that. Also, he was nice enough to give me samples of the pigments for me to try out. So I'll be doing a look for that soon, so stay tuned. Colour Forms will be available at your nearest Nordstrom counters and Nordstrom.com on July 11 (US/Canada) and August 2008 (International). But get to steppin' right now and pre-order your favorite before they sold out! 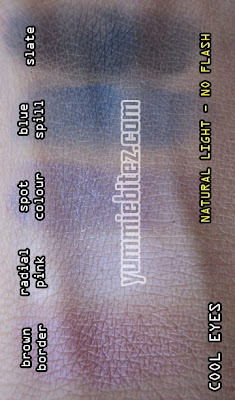 Based on the swatches, what do you think you'll be getting? ooooh, thx for the swatches. I have yet to pre-order my goodies. I'm not too sure on what I really want to get but for sure I want Rose Go Round and Royal Flush. Maybe I'll go this weekend. it works great! do you know if the brush sets are online at nordstrom? i wanted one but have no nordstrom near me. i should check and see if it's online! 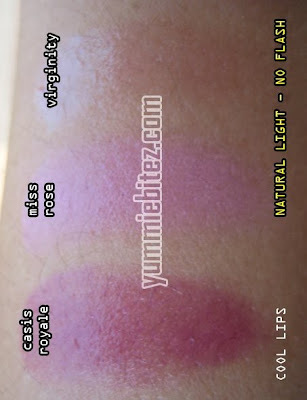 @ jaclyn rose: royal flush is nice but it kinda reminds me of a piggie that I have from pure luxe. 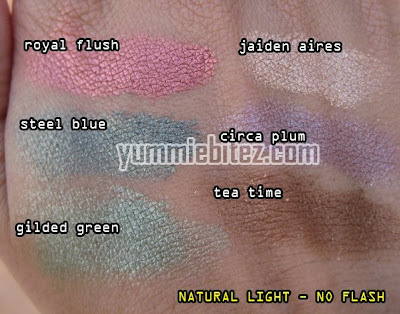 @ spankedelic: yes, the brushes should be available at nordstrom.com to be pre-ordered. 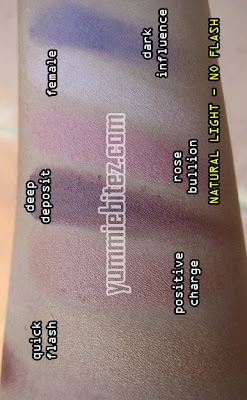 Lovely swatches! 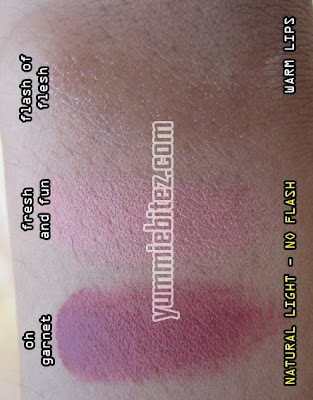 Is naked to the core more muted pink or more peach? I like this years anniversary goodies .. there's more stuff! I'm tempted to get the brush set with 129, 224, 266.. but I don't need the 190. From last year's set, I only use the 187 se.. not so sure if it's a great idea to be buying them instead of the full size. Glad you liked the brush sets, a lot of people said they were not good quality...I haven't seen them as I was debating if I need anything from there, LOL, I say "need". Im excited about VEGAS!!!! Maybe we should hit up CCO again? I think I may have to get the Powders and a couple piggies! Thank you for the swatches! although i dont even know if i'm gonna pick a palette up... the packaging is so chic-looking.. it's almost tempting! dood anne, i totally forgot that it was at nordy's... i wonder if they will send it here to japan. i want the brush set at LEAST. but i like the warm eyes. niiiiice. i ordered the advanced brush set! i bought one of their heirloom brush sets a while back and like it! i know some ppl don't like them cause they're littler, but they work just as well. my blush brush (don't remember what number) was shedding but i guess that's normal for brushes to shed when you get them! ahh! 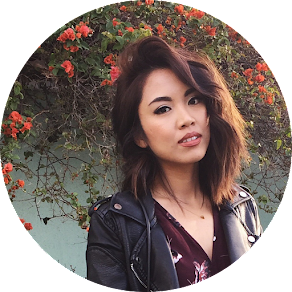 i'm so indecisive on whether or not i should buy from this exclusive! O_______________O Pictures galore. 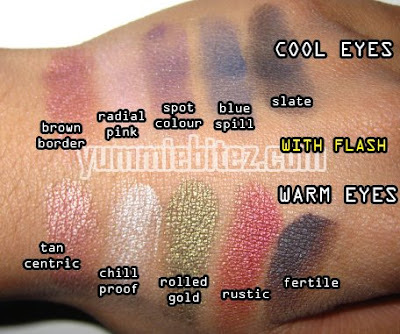 I want the warm eyes palette along with all the other colors haha except the cool eyes. ...WOW!!!! 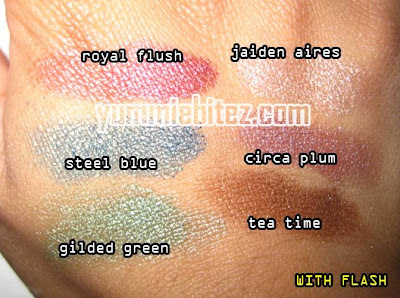 *picks up jaws from the floor* I'm kinda mad at MAC right now for releasing all these awesome collections one after another! I'm going bankrupt really soon! LOL! 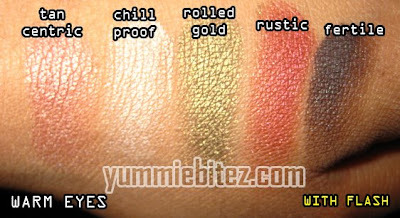 Awesome swatches though! thanks so much for the swatches.. even though i swatched some it's still nice to see what they look like in photos.